Could you tell me the name of the fabric? The name of the fabric is Montmartre, designed by Suzanne Kasler for Lee Jofa. I think the color on this one is the blue and clay. What fabric is the window treatment? Cabinet colour? - What is the cabinet colour? Thanks! I would also love to know the cabinet paint color. 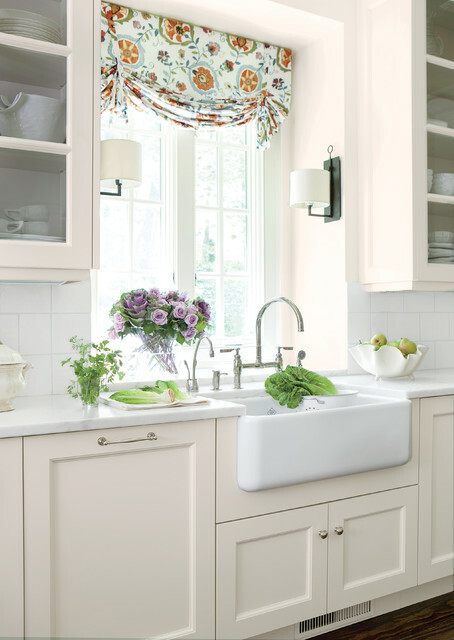 I have the same white farmhouse sink but my cabinet colors clash with the white. Who is the bowl on the counter made by? Pulls and Knobs - Where can I purchase these pulls and knobs please. Thank you. Sink - Is thiis he 30" or 36" sink? Thank you! Lighting - Could you please tell us the manufacturer for these sconces. They're lovely.